Scale is one of the key principles in any design scheme, and is particularly important in smaller spaces. If your apartment doesn’t quite have the same floorspace as your dream country estate, then you might be craving ways to decorate for the upcoming holidays. 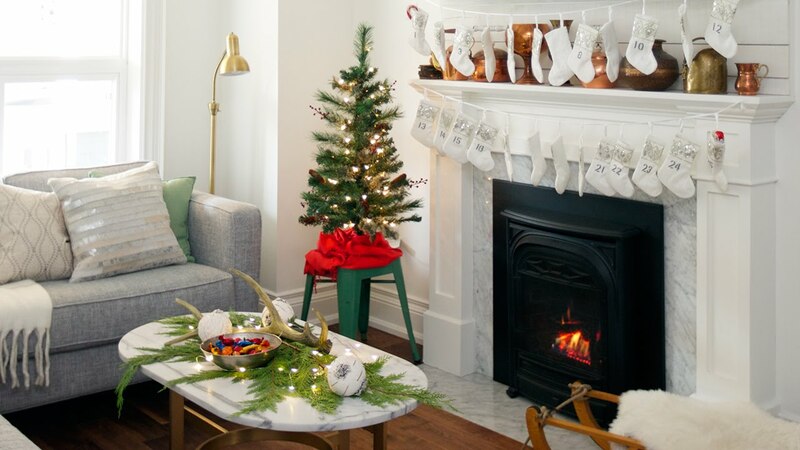 While you might have to hold off on that seven-foot Douglas fir, you can still get the most out of your small space with our guide to decorating for the winter holidays. Just because you don’t have the front lawn for a full-on light show doesn’t mean you can’t get creative with your holiday light selection. If your landlord won’t let you line the roof of your apartment with Christmas lights, consider stringing a few lights around doorways or across the mantel and join in on the festivities. We love decorating with candles almost any time of year, and the holidays are a particularly great time to add in a few extra candles around the house. If you don’t have room for the full menorah or advent wreath, consider adding smaller candles on bookshelves, mantles, and tables. It’s just as festive, without taking up as much space. If you’re insisting on putting up a Christmas treethis year, consider going for an artificial option. Not only are they more environmentally friendly, but artificial trees come in a wider variety of shapes and sizes than you might find at the tree lot. This Burberry Fir tree is particularly slim, but will look just as good as any other tree with a few presents underneath it. If you don’t have the space for a Christmas tree, but still want to decorate with a bit of greenery, consider picking up some holiday-appropriate plants. Holly plants are a wonderful addition that won’t break the bank, and will fit into smaller spaces. And if you’re worried about how your plants will fare in the colder weather, check out our guide to keeping your plants alive through the winter. Christmas wreaths are a classic holiday decoration, and look great on the front door. But if you don’t have the space or the place for a full-sized wreath, consider a piece of mistletoe. Mistletoe hangs from the ceiling, so it won’t get in the way of any of your other decorations. It’ll bring just as much Christmas charm, and maybe even a bit of romance. Anyone who has ever entertained knows that space is a valuable resource. If you’re planning on feeding any guests during the upcoming holiday season, consider investing in tiered food platters. While you shouldn’t try to squeeze the Christmas ham onto a tiered food platter, they’re perfect for smaller dishes, like appetizers and deserts. If your apartment lacks a mantle, or if your mantle is already full of holiday wares, consider placing stockings elsewhere in the home. Stair railings, bed frames, and freestanding shelves are all great places to fill up on stocking stuffers.